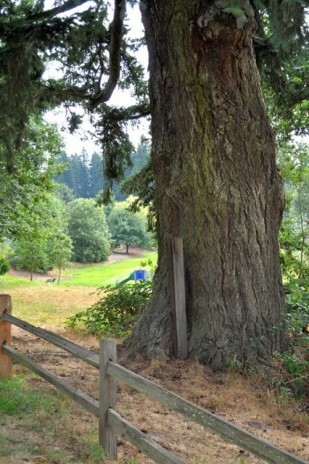 On Friday, May 9, 2014, at 1:00 p.m., the Oregon State Heritage Tree Program will honor one of the City of Wilsonville’s most prominent landmarks when it inducts the Robert Valentine (R.V.) Short Heritage Fir Tree into the official state roster of heritage trees. The towering Douglas fir stands on the remnants of R.V. Short’s original donation land claim at Merryfield Park in Wilsonville. Oregon Travel Experience (OTE), the Oregon Heritage Tree Committee, and the City of Wilsonville will host the public event. Wilsonville Mayor Tim Knapp and R.V. Short’s great grandson Doug Anderson will share the history and the treasure behind the notable citizen and the tree which bears his name. Heritage Tree Committee member Charlotte Lehan and OTE’s CEO Kyle Walker will be featured speakers as well. While most other Douglas fir trees near this location were logged to create farmland, the R.V. Short fir remained as a landmark. As a land surveyor, Robert Valentine Short surveyed claims throughout the northern Willamette Valley and in 1850 created the first plat of Portland. Short was a member of the first Oregon Constitutional Convention, the first Yamhill County Surveyor, and a State Legislator. The R.V. Short Heritage Tree possesses an impressive set of statistics — at approximately 300 years old, the fir stands 119 feet tall with a circumference of 16 feet and one inch. Its crown spreads 55 feet. Following the unveiling of the plaque, refreshments will be served. All are invited and students are encouraged to attend. Oregon Travel Experience (OTE) oversees the official Oregon Heritage Tree Program and is a semi-independent state agency located in Salem with a focus on transportation-related services. OTE builds programs that help drive new traffic into nearby communities, contributing to local economic prosperity. The agency manages 29 rest areas across the state, permits highway logo signs and administers to two heritage programs: Heritage Trees and Historical Markers. *The exact location of the tree requires a short walk or wheelchair ride from street parking along S.W. Camelot. Contact Oregon Travel Experience for help with directions by email to event@oregonte.com or telephone 503-373-0155.